That’s because Austin is the Live Music Capital of the World. With over 200 live music venues, music is spilling out from everywhere as you walk down the street. That soundtrack of life you’ve always wanted? It can pretty much happen in Austin. 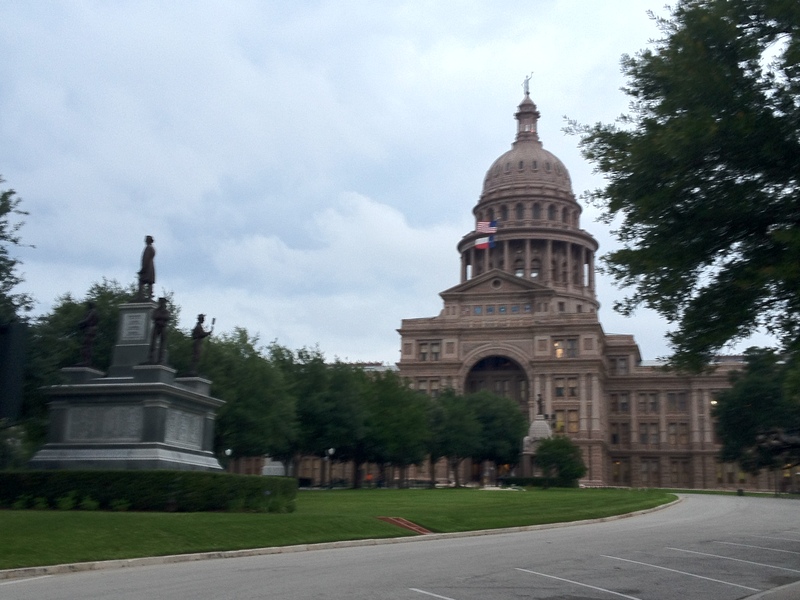 The stunning capitol building in Austin. It seems that everybody associates Austin with either music, sports, or politics, but did you know they have a pretty rocking art scene too? That’s what I went there to discover last week. What I found out was that a week is definitely not long enough to explore all the art that’s created in this very inspirational, innovative town. Daisy Undercuffler, the highly connected and helpful concierge at the Four Seasons hotel where we stayed, put together a long list of galleries, museums, public art displays, and studios for me to visit during my stay. There was so much, in fact, that I only made it about halfway down her list! I started my tour at the Blanton Museum of Art located on the University of Texas campus. Although this museum does not specialize in local artists, this was a good jumping off point. 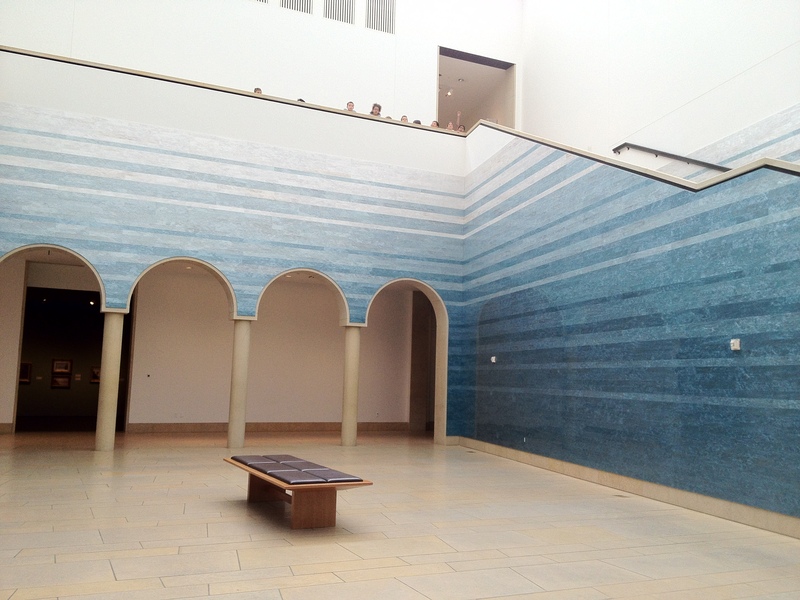 The Rapoport Atrium alone was worth going to check out for its Stacked Waters installation by Teresita Fernández. The Rapoport Atrium with the “Stacked Waters” tile installation wrapping the walls. Notice the tiny heads at the top of the staircase? Those are school children visiting the museum. There was 3100 square feet of custom-cast acrylic tiles which lined the walls. 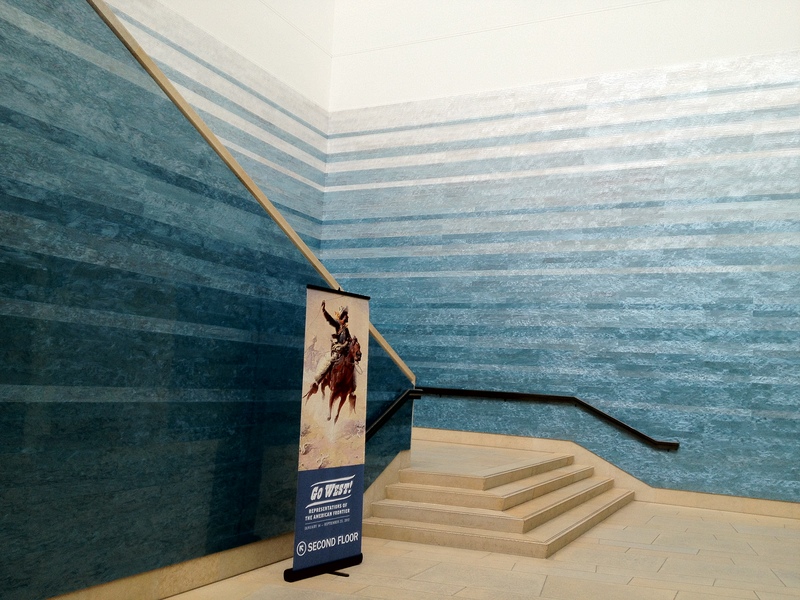 The stripes went from dark blue to white as they moved up the wall, creating the reflective experience of water. 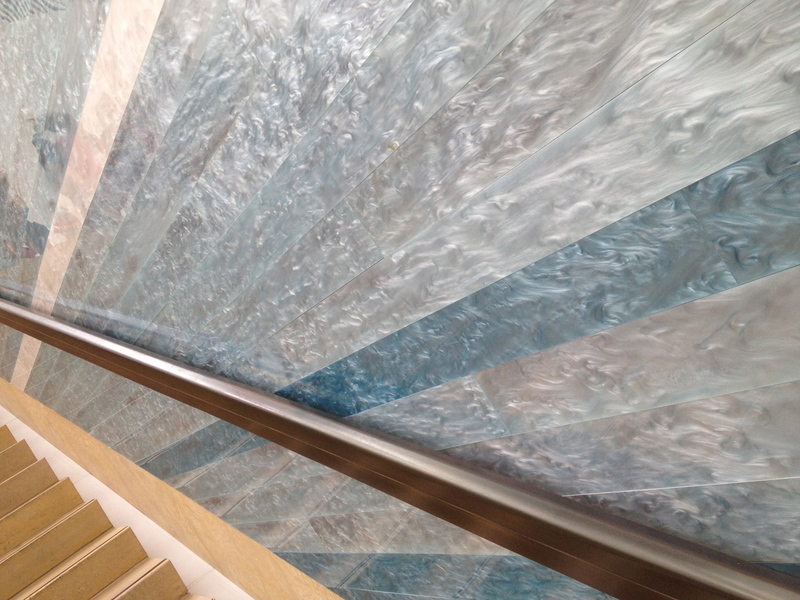 You can see the stripes and how swirly and reflective they are as you go up the stairs to the second floor. The Blanton Museum was playing host to two traveling exhibits when I was there. The first, American Scenery: Different Views in Hudson River School Painting has since moved on. As you can imagine from the title, this exhibit focused on the art of men and women who drew inspiration from the landscape, specifically that of the eastern United States, in the Hudson River Valley. I have always been a fan of Thomas Cole, the founder of this school of painting. His work relaxes me and takes me on the spiritual journey he intended, using light, peaceful rivers, and majestic trees to calm my soul. I had never known, however, how important that group of painters was to the environmental movement, as well as how influential they were on the National Parks System. The second traveling exhibit, Go West! Representations of the American Frontier will be there until September 23, 2012. Like the Hudson River School of painting, painters from this group also demonstrated the changing landscape, people, and events of the West as it was taken over by the settlers. My next stop on the tour was Gallery Shoal Creek, directed by Judith Taylor, whom I was told, was the person to talk to in order to learn about Austin art. Ms. Taylor was so kind to walk me through her gallery and talk to me about all the local artists her gallery represents. I particularly loved the art of Katie Maratta, who creates long pencil drawings of West Texas landscapes. The drawings are done on ribbons of paper one-inch high and from 12 inches to 51 inches long! The viewer must get up close to the tiny images, almost stepping into them. The result is this feeling of vast expansiveness so common in the flat land of West Texas. It’s like traveling without leaving the ground! I can’t say enough good about Judy and Gallery Shoal Creek. She really made me feel welcome to Austin and gave me such a wealth of information to carry with me on my journeys around town. Those resources, along with the complete list I was given from Daisy at the Four Seasons, will be available in my next article, Walk Austin. Judy and Daisy work together, by the way, to curate the artwork found in the lobby and reception areas at the Four Seasons. After my tour, it was fun to walk around the lobby again and recognize the names of artists I had encountered throughout the day. One of those artists was one I discovered at my next stop, the Davis Gallery + Framing. I spoke at length with Lisa Rogers, the Assistant Gallery Director. Like Judy, she was armed with a wealth of information about local art and artists. She took me around the gallery and introduced me to the stories of the people who created the art in front of us. I particularly loved the art by Orna Feinstein who creates 3D images using paper, fabric and acrylic. Although her style was completely different from that of Katie Maratta at the Gallery Shoal Creek, they both draw the viewer into their artwork to get up close and personal with it. And that artist whose work I stumbled across in the lobby of the Four Seasons? His name is Philip Durst. The Davis Gallery represents him and has a nice collection of his work on view. He is a collagist whose works are unmistakable as he creates whimsical patterns with the pages of old law books and Dum Dum lollipop wrappers, bright cereal boxes, and other fun finds. His wife is an artist in her own right, creating beautiful quilts, and Mr. Durst’s work was inspired by the patterns he sees in his wife’s work. Knowing these things made it all the more fun to discover two of his collages hanging in the lobby of the Four Seasons when I returned from my visit with Lisa. Judy and Lisa were the two heavy hitters on my tour that day. They were welcoming and fun to talk with about Austin art. When I left their galleries, I had a longing to visit the city more often so I could participate in such things as the West Austin Studio tour, which is this weekend (May 19-20, 2012), and the East Austin Studio tour, which is sometime in the fall. By the time I left the Davis Gallery, I was filled to the brim with information. It was time to pull back a little and process everything. So, I chose to check out some public art on my list. 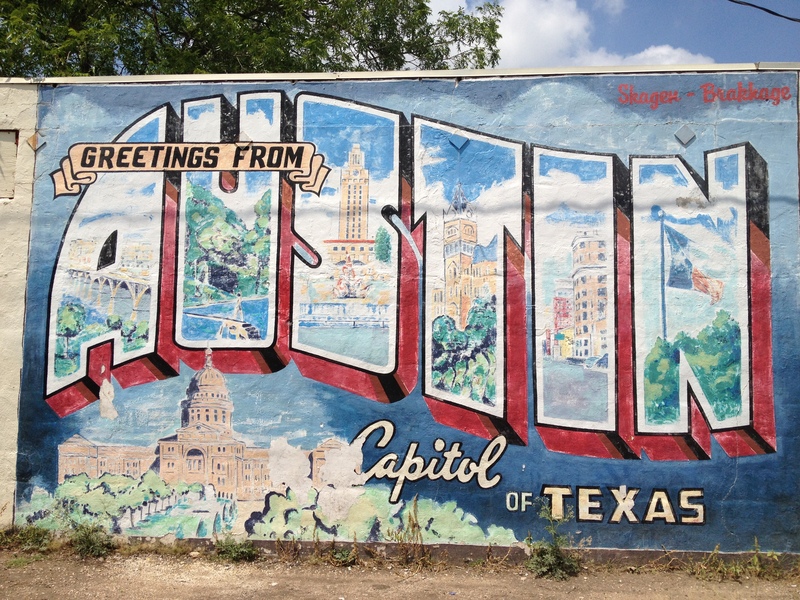 The Austin postcard is a mural painted on the side of the Roadhouse Relics store. It measures 10 feet tall and 20 feet wide. Roadhouse Relics specializes in handmade, custom neon signs, by the way. Pretty cool. Check out their website. This mural was painted on the side of the Roadhouse Relics building. My next stop was the Stevie Ray Vaughan statue located at Auditorium Shores along Lady Bird Lake. Although he was not originally from Austin, his music and his support of the music community in Austin before he died makes him a treasured son of the city. Before the day was over, there was one more place I had to go. 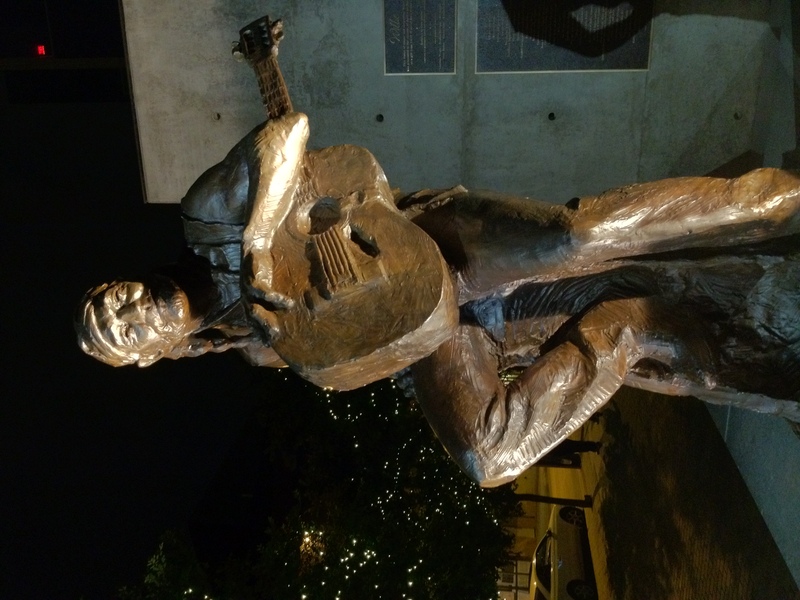 I dragged Hubby to the Willie Nelson statue located on Willie Nelson Boulevard (previously known as 2nd Street). Mr. Nelson’s statue was unveiled just about a month ago. It sits proudly in front of the W Hotel, which shares the block with Moody Theater. This live music venue, which seats nearly 3000 people, plays host to the award winning Austin City Limits on PBS. All this is important to know because Willie Nelson was the very first artist to play on Austin City Limits back in 1974 when it went on air for the first time. Mr. Nelson has been a great influence and lent his support to Austin’s music scene throughout the decades. For grins, this is my favorite Willie Nelson song. I think it must be the theme song for every travel blogger, no? For more information about art in Austin, take a look at Aether, the online visual arts magazine Judith Taylor puts together in collaboration with other gallery owners and directors. Art Austin is an online guide to Austin art. It has a comprehensive list, by month, of all the events happening throughout the year. You can also click on different gallery and studio names to learn more about them. It’s a great resource. My Walking America series continues this weekend with more from Austin! Be sure to subscribe to this blog to receive notification when it comes out!